The 43rd BRINOS Ear Surgery Camp followed directly after the 42nd A new combined British and Nepalese team of surgeons, anaesthetist and nurses continued to operate on patients. Many of these patients were suffering from chronic ear disease and deafness due to otosclerosis (this is fixation of the third of the three little bones in the middle ear). They had been screened and prepared by the BRINOS Ear Health Community Service (BEHCS). Altogether 103 major and 14 minor operations were performed, the majority of which were under local anaesthetic. Below, it can be seen that the prospect of building an ear “hospital” on the Fateh-Bal Eye Hospital campus advanced been changed. 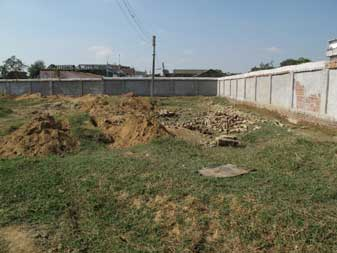 A new site had been procured and a brick wall had been built around it. The plans for the hospital are nearly complete.